Especially now, when rigid models of thought and action seem to have reached the end of the line, in ecology, economics, technology, culture, science, society and even in our own private lives, perhaps a free and floating thought could help us to create projects as coagulations of abstract and concrete knowledges. I started this project when I met the textile collection in the Civic Museum in Modena where some fabrics of the renaissance period are preserved. The ancient books of models and inventory for decorative arts as well, suggested me the embroidery on the bottom of the plates. 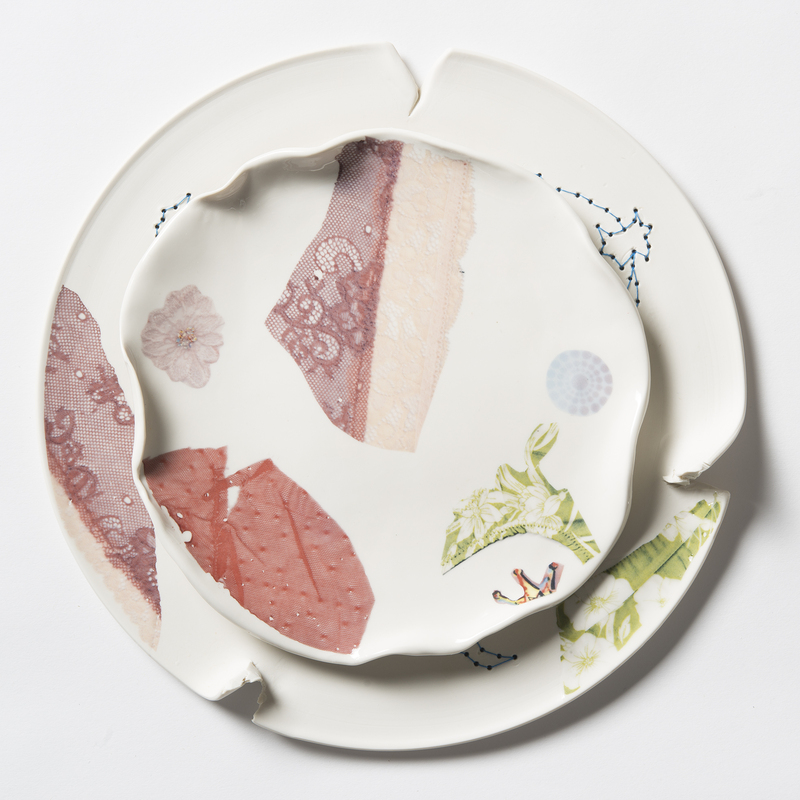 I’ve looked for a shape suggesting the idea of ripped clothes and the white french porcelain of Limoge allowed me to get this kind of shapes.The set is composed of twenty-four dishes made of porcelain: eight white soup plates shaped and polished by hands, eight dinner plates hand made decorated with decalcomania, and eight under plates modeled on the lathe, decorated with decals, drilled by hands and embroidered. 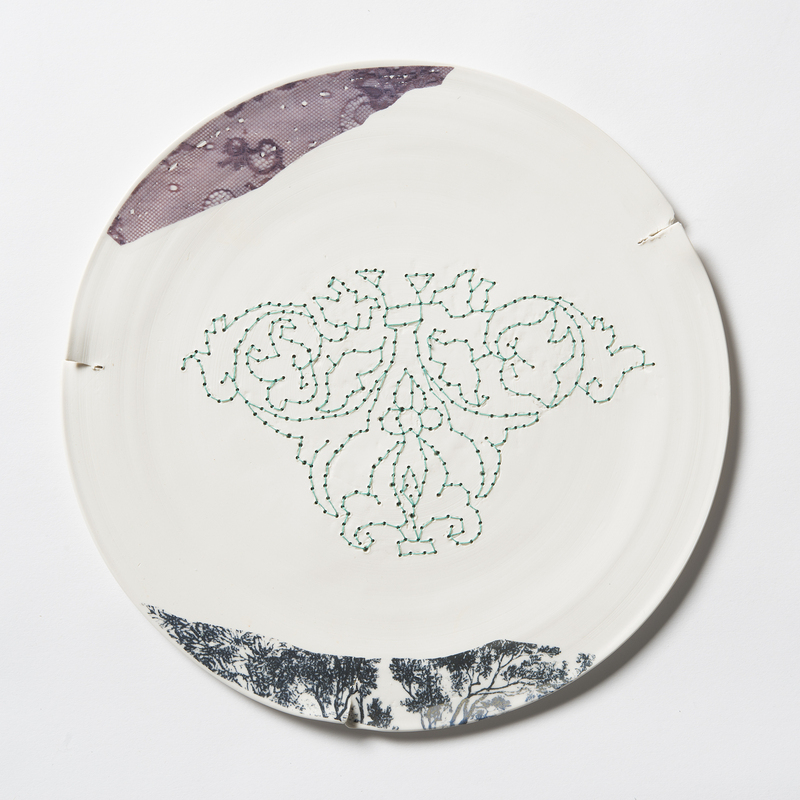 The plates can be used for serving food and can be washed and dried normally . 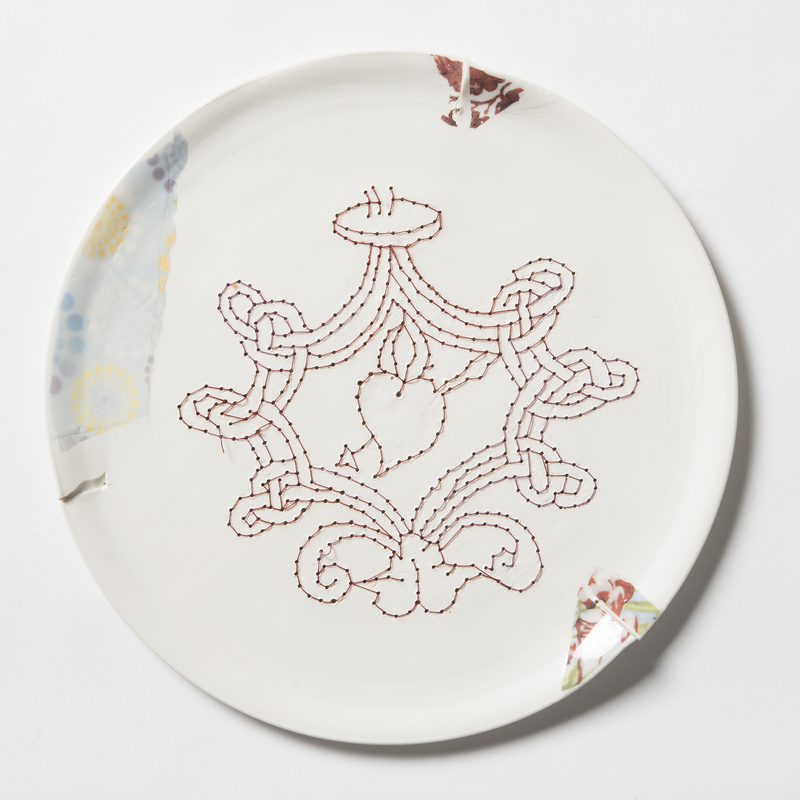 Only the under plate requires special attention because of the wire and the biscuit surface. 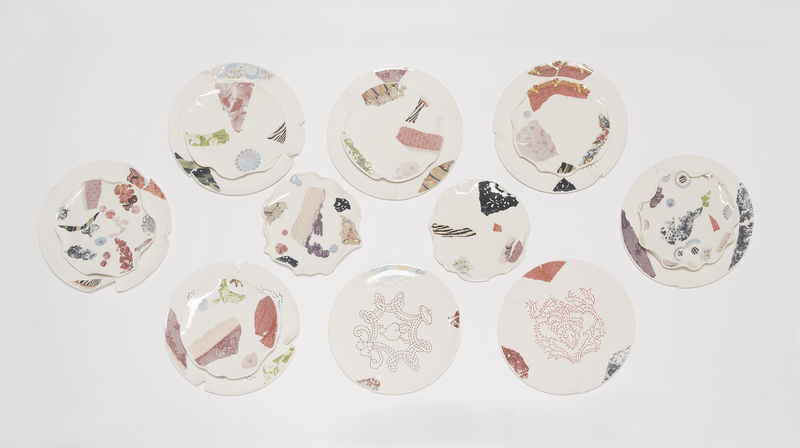 Every plate is an unique piece. The design was carried out with textile prototypes. I used simple and basic shapes and my artisans made them by lathe while the objects were drying I made my intervention on the soft ceramic. 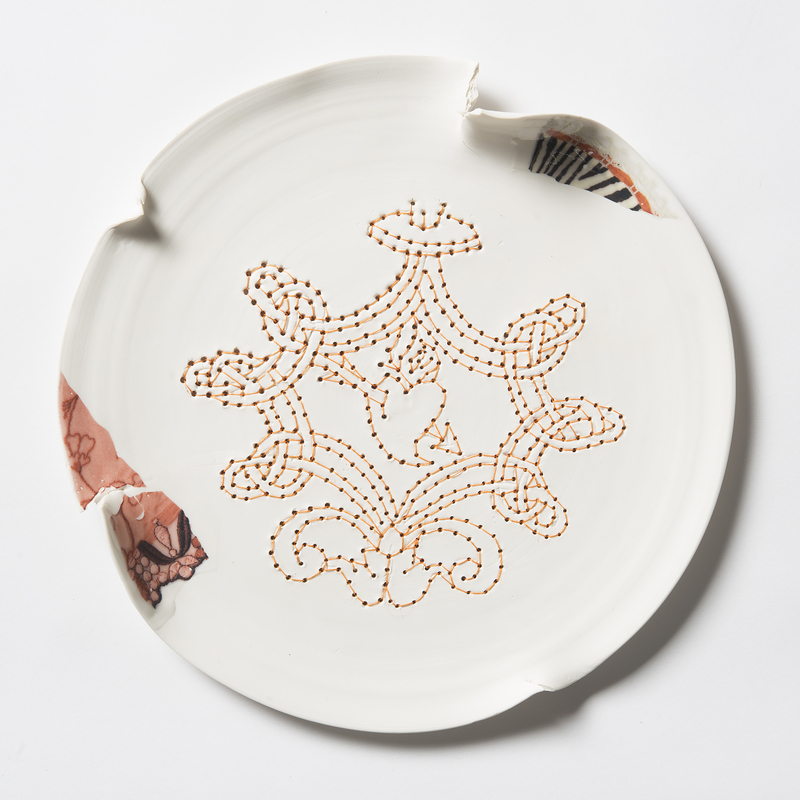 I modeled and ripped other plates by hands.then I needed a special artisan to product digital decals. 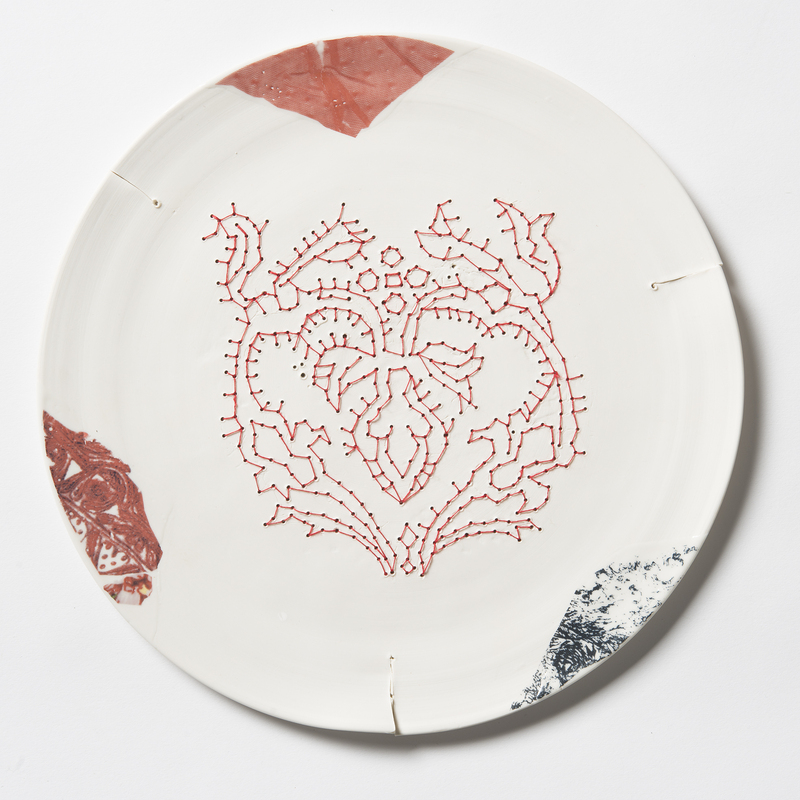 he plate has been hand crafted with the use of the lathe in the Venetian workshop of Bertolin brothers.The dishes were handmade by me and cooked in Bologna . 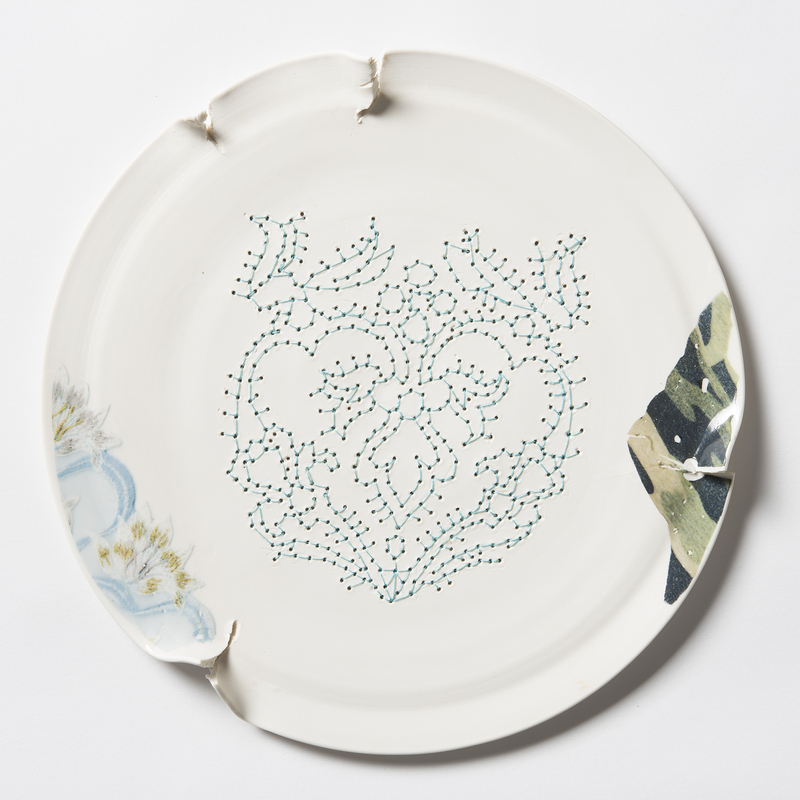 The last step was the sewing of the plates. 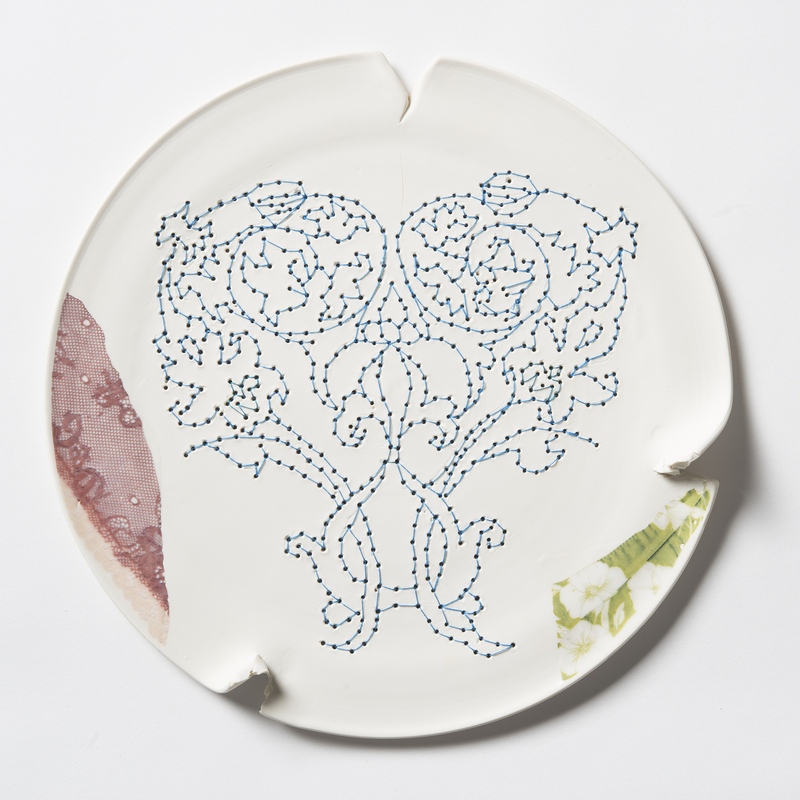 set of 24 dishes porcelain, modeled on the lathe, decorated with decalcomania, perforated and sewn with cotton wire. 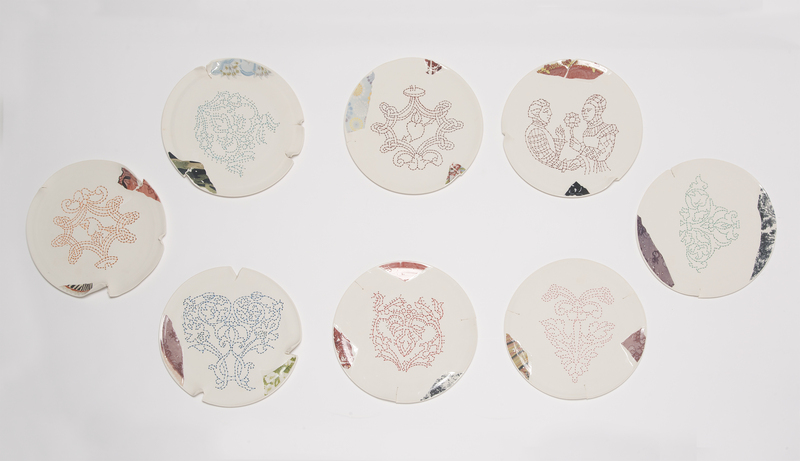 8 placemats made in biscuit, decorated by decal and needlework; diameter 33 cm. 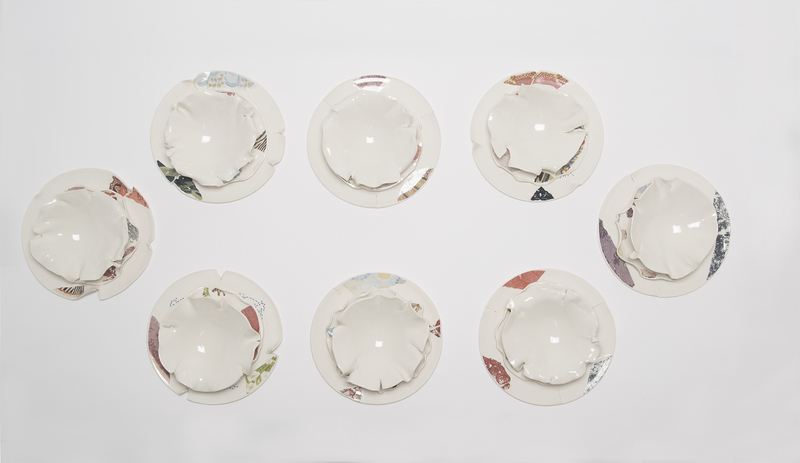 8 soup plates white porcelain crystallized :diameter 24 cm. 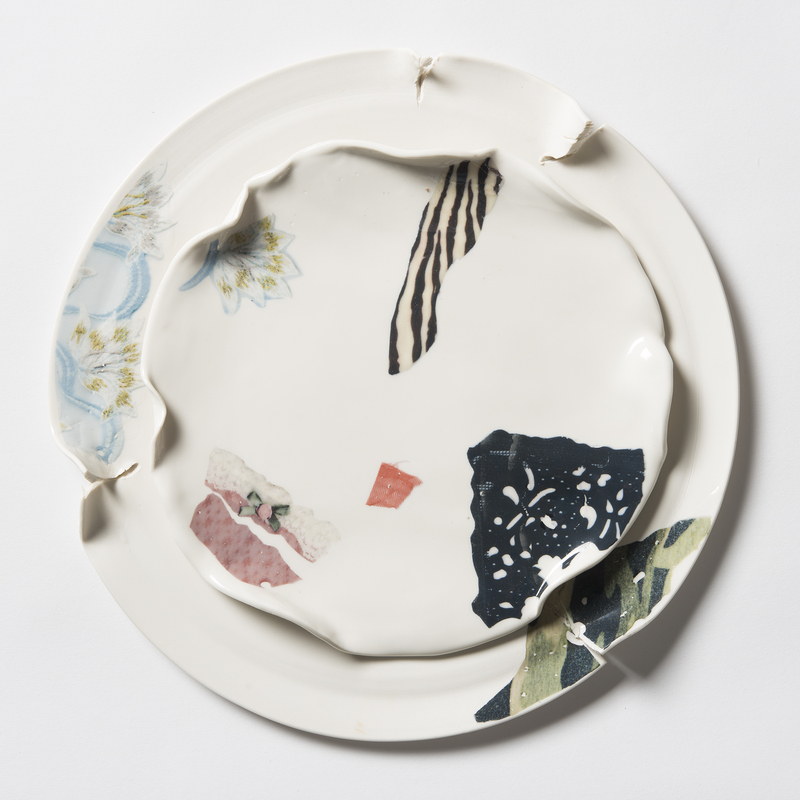 My aim was to carry on my research about art and ceramic checking the boundaries of booth in the daily life rituals. 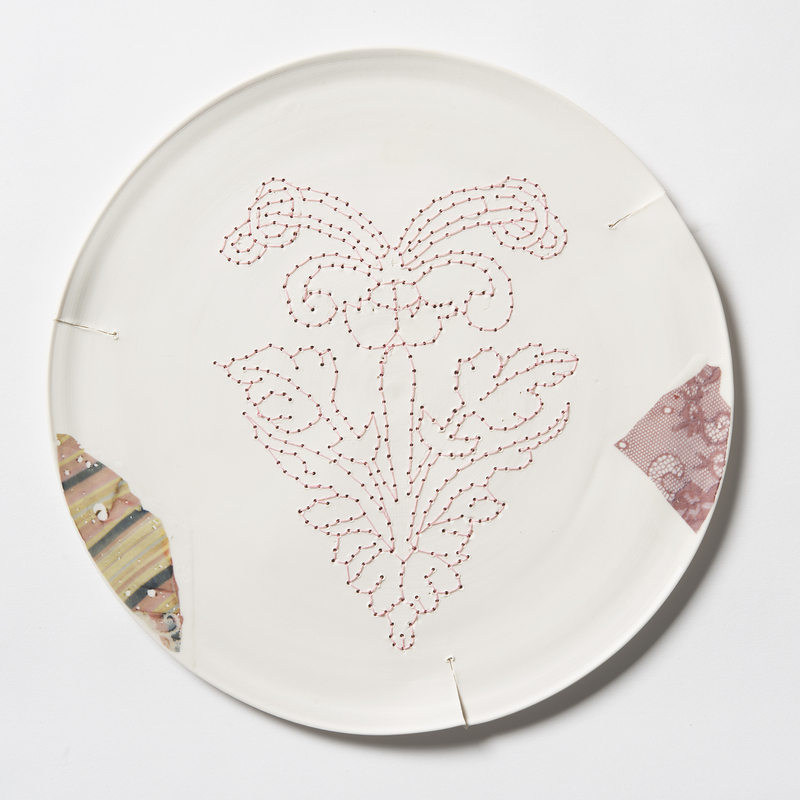 I think that this project can’t be considered a very design project, but an experiment where sculpture, textile art and ceramic design are woven together.The interaction consists in the visual osmosis between food and textiles-The embroidery of the plate has the function of absorbing heat, and smooth out the irregularities of the surface of the plattersThe project started in March 2014 in Bologna , continued in Nove (Italy) at the 3B company (Bertolin’s studio), and ended in Bologna in ceramic laboratory Argilledintorni in March 2015.The realization of this project has been a challenge for artisans who have followed and recommended me. 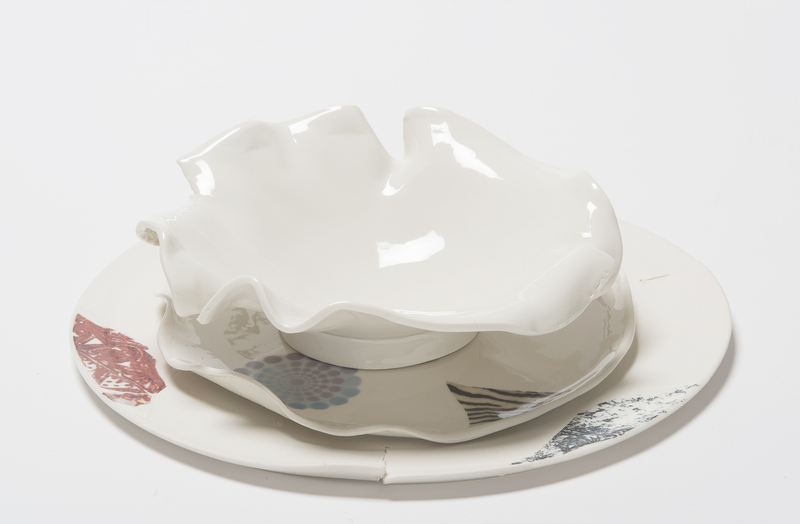 We have made many mistakes and broke many pieces because of the the holes, the folders and the cuts.The foldings create unpredictable tensions inside the objects during the cooking. There were three types of cooking for the biscuit, for the polishing paint, and the last for the decals.I t was necessary to involve different artisans during the various steps.